If you’re looking for ways to plan a budget-friendly family vacation, you may be wondering what you can do to save money. Fortunately, there are a number of easy ways to make your trip more affordable. Here are five ways to plan a frugal family getaway. 1. Book your trip at the right time. When you plan your vacation during the off-season, it can save you a lot of money in the long run. Rather than going to Walt Disney World during the summer months, why not book during the schoolyear? If you can’t manage to take your kids out of school, you might consider going over a holiday weekend. You’ll spend less time there, but the savings may be worth it. 2. Use credit card rewards to your advantage. Cashback rewards can work in a cycle. You can use your cashback money to put towards your vacation, but you can also earn more cashback rewards by using your cards while you’re on vacation! If your cards offer frequent flyer miles, you can also use them to your advantage. To come up with a plan to get free plane tickets using credit card rewards programs, you may want to check out RewardExpert. 3. Consider taking a staycation. Who says you need to go far in order to have fun? You can create lifetime memories just by going to a local amusement park or the nearest beach. You may even consider going camping at the nearest state or national park. 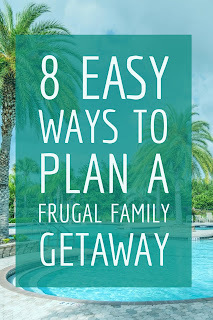 The possibilities for a frugal family staycation are endless! 4. Rent or share a vacation home. Renting a house can be cheaper and also gives you more space than a hotel room would. If you have friends or family who are traveling to the same location at the same time, why not see if they want to share a house? I’ve had good success finding vacation homes to rent on HomeAway and FlipKey. 5. Consider renting a car for your road trip. Although it seems cheaper to take your own car on a road trip, there are a few scenarios in which renting a car can be a wiser option. If your car already has a lot of miles on it, road tripping too frequently will just decrease its value. If you lease a car, you may also go over your mileage and end up owing more at the end of the year. To find the cheapest car rental, check out AutoSlash, which helps find you discounts and even re-books you when it finds better deals. These are just five of the things you can do to plan a frugal family getaway. Whether you’re going to Walt Disney World or your local amusement park, it’s possible to make a trip fit into your family’s budget! Erin Gifford is a mother of four who looks up and down for ways to save money on travel for her big family. She has a family travel blog, Kidventurous, which was recently selected as a top family travel resource by Parents magazine.